ANF | TJA: This resistance is for life! 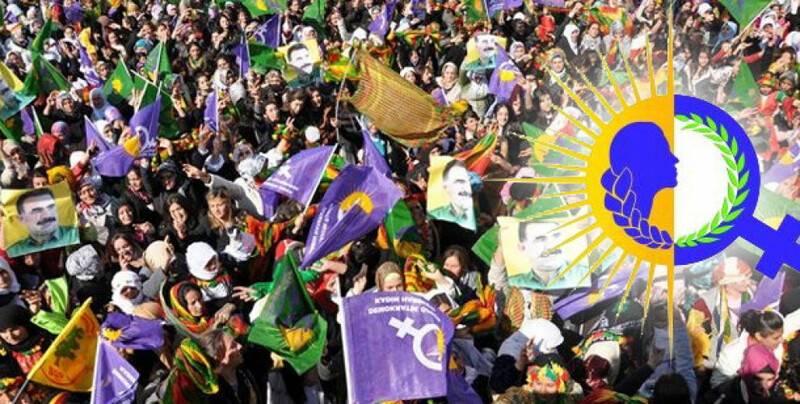 Underlining the ongoing violence and attacks against women all over the world, TJA said that Kurdish women are leading all women of the world in the resistance. The statement said: “In this process where women are fighting all kinds of oppression, violence, exploitation and isolation that the men-dominated system tries to impose on women, women are organized: we continue our struggle against all odds. While the Third World War, which was initiated by the capitalist-statist civilization, has been deepening in the Middle East day after day, the struggle for equal and free life, co-existence of peoples, beliefs and cultures is developing under the leadership of women as a third way. We have never been silent against the policies of oppression, exploitation, isolation and violence carried out by the AKP-MHP alliance which has been in power for 17 years. Wherever we are we continued to struggle shoulder to shoulder. The statement continued: “The absolute isolation imposed on Abdullah Öcalan, the leader of the Kurdish People's, has also prevented the development of a democratic solution leading to a lasting peace. Our leading politician Leyla Güven is on hunger strike together with deputies and hundreds of people against the attitude of the fascist AKP-MHP alliance. Hundreds of women and political prisoners have gone on hunger strike, the resistance has spread all around the world. Against those who want to condemn us to darkness today, we are responding with the resistance of Leyla. We are resisting the fascist mentality that tries to intimidate us by enlarging the resistance. We will continue to increase our struggle by raising our voice.